War Child facilitated a Child Rights Situational Analysis in Syria to better understand the impact of the conflict on children and ensure that children’s perspectives inform humanitarian actors’ response plans for Syria. The report contains data and analysis collected by researchers through focus group discussions with 391 Syrian children, as well as direct quotes and reflections from children themselves. The report concludes with a set of recommendations for humanitarian actors to ensure that children’s perspectives are taken into consideration. War Child will continue to expand our support services for Syrian children from our Beirut office, using the CRSA as a basis to better understand the situation and needs of children inside Syria as well as those of Syrian children who have fled to Lebanon and neighbouring countries. Thorough analysis and project planning processes were undertaken for twenty-eight new projects in seven of our programme countries that received funding from institutional donors in 2013. 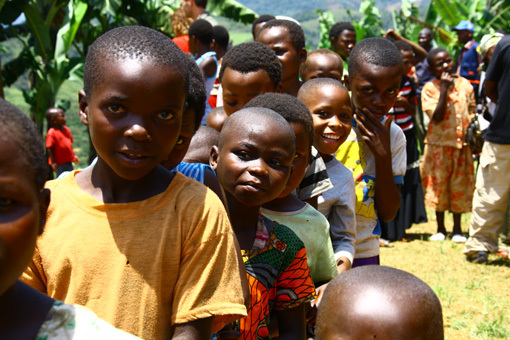 During the development of the ‘Protection of children and young people affected by armed conflict in South Kivu’ project in, for example, field assessments were carried out through interviews and meetings with children, parents, teachers, representatives from NGOs and local organisations, and authorities and local leaders. The assessment gathered information about child protection issues, helping us identify existing risk and protective factors and the existence and effectiveness of structures and mechanism working to prevent and respond to child protection risks. In 2013, War Child conducted a child protection assessment and a child participation baseline in Central and Eastern Equatorial States in South Sudan, which informed War Child’s child protection work in the country. The assessment was conducted in seven communities, from which seventy children and eighty-five adults provided input during workshops, focus-group discussions and interviews. The child-led baseline for our Partnership for Peace project in South Sudan and DR Congo assessed knowledge on child participation, existing platforms for participation, acceptance of and obstacles to child participation, child protection risks, and community-based child protection services and monitoring mechanisms. In nineteen randomly selected communities, 686 children were trained to collect data through a questionnaire. They interviewed 1,992 children and 685 adults. In addition, ten to fifteen children and adults per community participated in focus-group discussion on the child protection situation in their communities and on caregivers’ support. War Child implements community-based projects in Burundi, Uganda and DR Congo. In participatory needs assessments at the start of each of these projects, the communities identified challenges and opportunities that positively or negatively impact the protection and well-being of children. The communities then developed action plans to improve the protection and well-being of children and implemented them with support from War Child. In Burundi, we started working in twelve new communities (collines) in 2013; twenty-five children, youth and adults represented each community in the development of the community action plans. A key challenge in our planning processes is that some of our projects are still designed to focus primarily on implementing certain activities instead of achieving measureable immediate and intermediate outcomes for children. In 2014, War Child will start developing a set of core interventions that can support country programmes in planning coherent and recognisable ‘War Child’ projects that work toward clear outcomes and meet our quality standards.